EURUSD is under the influence of Revised GDP q/q, French Gov Budget Balance and German Factory Orders m/m in Eurozone and Consumer Credit m/m and Trade Balance in the US area. The support rests at 1.05720 with resistance at 1.06000 which the weekly pivot point at 1.05810 is located in between the lines. The EMA of 10 is moving with bullish bias along the ascendant channel and it is below the EMA of 100 and 200. The RSI is moving horizontally on the 50 level, the Stochastic is showing upward momentum and the MACD indicator is in positive territory. The ADX is showing buy signals. 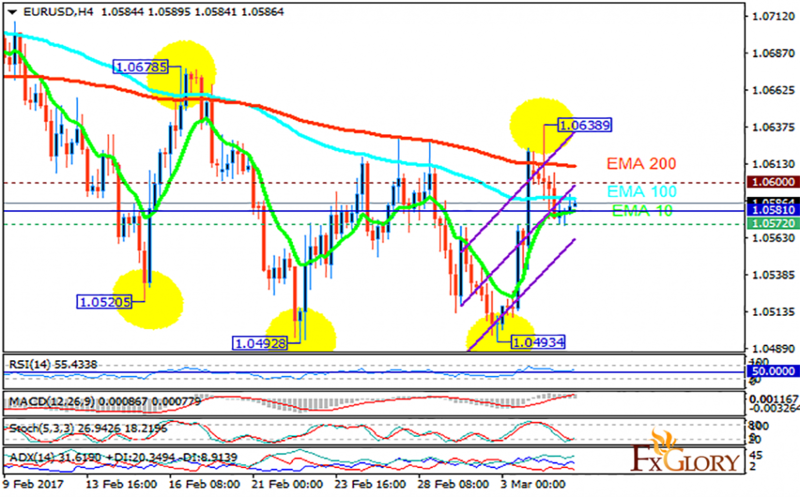 Despite the pair’s attempt to rise, we stay bearish on this chart therefore sellers can target 1.050.